Take control and lead the life you want to live. Do you avoid conflict and confrontation? Do you struggle to make decisions? What if you could confidently answer no to all of these questions? With How to be Assertive in Any Situation you can. Discover life-changing techniques to help you express your needs openly and calmly; set boundaries and deal with expectations, demands and criticism; make clear decisions without ever feeling anxious. Challenge your fears, grow self-confidence and steer your life in the direction you want to go. 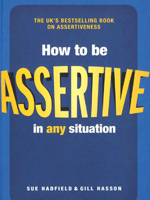 1 What does it mean to be assertive?